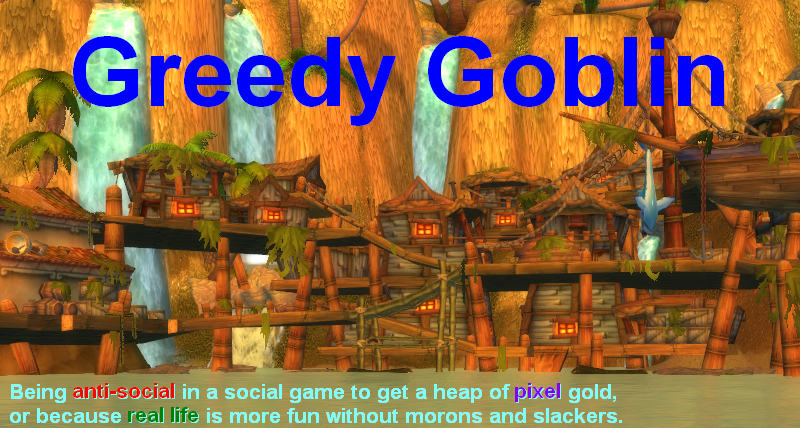 Greedy goblin: Follow the Shoe! Larísa posted about a Swedish interview with Kungen and Marilyn. While the interview had several interesting field, including one I long wanted to comment, but to do it I first has to beat the endgame myself (of course slower than the Nihilum). However most of it is while interesting, non finance related so would have no place in this blog. It's Oriniwen's comment on this post that inspired this one. While most people laughed on the idiots who follow Kungen around Orgrimmar (like the Holy Shoe in the Life of Brian), she said "When I don't know what to do in terms of spec or raid comp or professions or whatnot, I ask myself "WWND?" What Would Nihilum Do?". I can't tell how much I disagree with this idea. I'm not talking about the fact that in this moment Kungen has 11K HP, 358 def, 27% dodge+parry, so if you go raid with such a tank, wipe is guaranteed. You are most probably capable of noticing 5/8 DPS T6 and find out that he is not preparing to tank Brutallus. The idea is wrong, because you are not in an enviroment like him. He is surrounded by 24 other extremely dedicated, skilled and geared players and it's the same for all Nihilum members. They can specialize extremely on one task, focusing all their resources (both mental and gear/spec) to be the very best in this. They can leave all the rest of the tasks for the others. For example Marilyn's current talent miss Improved Tranquility. Without it how can he outheal the massive damage of loose adds without aggroing them all? He doesn't have to. There are no loose adds in a Nihilum raid. Is it the same for your raid? Unlike your guild also killed Kil'Jaden before 3.0.2, you have members with different skills and dedication. Some of them may even fit into Nihilum. Some of them I would kick from a HC Shettek pug after the first pull. Most of them is halfway between these extremes. You have to deal with these problems, one way or the other. The best is of course if you can teach them to be better. But some people just don't have what it takes to be better. You can leave them and find more like-minded people, but sometimes your time schedule or gear does not let you in. These cases you have to deal with the performance of the others. You can say the underperformance of others is temporary, last until they learn or you get accepted to a better guild. But how about class numbers? Your guild may have too many mages and too few rouges. Unless you are a high-end guild, you can't recruit anyone you want. And the top of that, they are not even bad mages, so this is not a problem, it's rather a "flawor", like having 4 kids, all girls. Yet, you have to adapt this situation. Nihilum may do the same boss with a bear offtank and a paladin DPS, but with your mage army, a pala offtank and a moonkin DPS is better. And it's not just WoW. In life you have to face with less-then-optimal conditions where optimal solutions just don't work, and more primitive solutions do. A pencil and paper is better calculator then a 64 CPU supercomputer during power outage. While we are naturally attracted to flawless and beautiful solutions, we have to live without them. Pursuing them can be disastrous, like the Iraq War of G.W. Bush. I believe he wanted to create a democratic paradise for the people of Iraq, but it just could not work in a country where people see their religious/ethnical classmates good and the others evil. I think Senator (soon to be VP) Binden's plan would work much better. He suggested to split Iraq into Kurd, Shiaa and Sunni partitions so these groups would have their own land and would not fight each other anymore (since they were separated by borders). This plan was rejected since it includes ethnical separation (people born and lived all their lives on the wrong side of the separation lines had to relocate) and more or less acknowledge an Iran-like leadership in the Shiaa part. The democratic USA couldn't accept that. Why? Is the bloodshed is better? Democracy, liberalism, respect of human rights in Iraq is just as viable as "no bad pull" in 99% of guilds. You can learn from those who do better than you. You should! But all your knowledge must be adapted to the situation. If you just follow someone, even the greatest man, you are just a sheep. I get where your coming from, our guild got the point where there was 10-15 really good raiders and then always about 10ish that seemed always below par. I think you've got a point. Blindly copying specs etc from Nihilum probably isn't adviceable since their conditions are pretty different from an ordinary guild. I think you can get a little more of explanation of the thoughts about their specs etc if you look at their website. For instance Marily has written a druid guide, though it seems a bit old now.